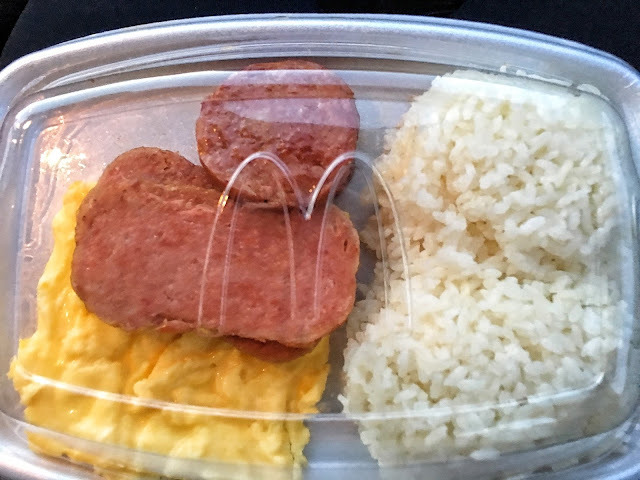 Did this McDonald's Breakfast plate catch your eye? I thought so! Hawaii and their rich culture includes some delicious cuisine. As a born and bred Japanese, sometimes American (mainland) cuisine can be too much; too sweet, too salty, too-everything. But in Hawaii, the flavors tend to be appealing to my appetite because of the Polynesian influence. With that said, stating that I ate my way through Maui might be an understatement! I ate as much as I explored the island and I have absolutely no shame. Pretty much everything I ate in Maui was delicious; can't think of one thing that I didn't like. Without further ado, let's get into the good stuff! McDonald's Spam & Portugese Sausage Breakfast - That's right, I listed McDonalds. If you travel internationally, you know that each McDonald's serves items that are local to the country. No, I don't normally eat McDonald's living in the U.S but when I'm abroad, I enjoy seeing what they have. In Hawaii's case, they serve Spam & Portuguese Sausage Breakfast Platters. I grabbed a platter on my way to the Road To Hana and gosh, it was so delicious! 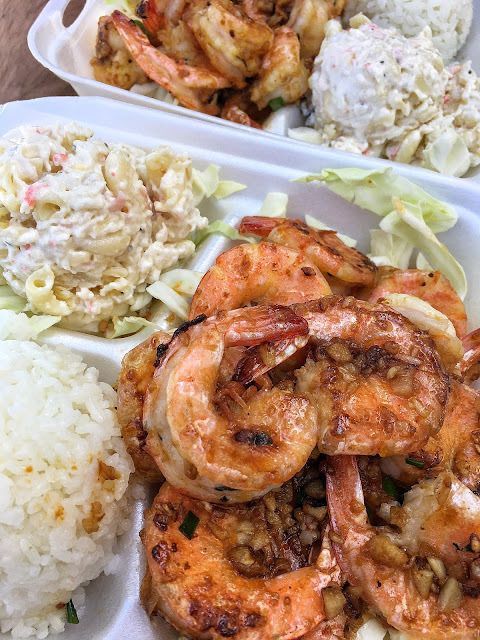 Geste Shrimp Truck - If you enjoy garlic and shrimp, this place will blow you away. Since it's a food truck, there are no seats. In fact, the grass around it is so prickly, a lot of people were eating in their cars. Their Hawaiian Shrimp in my opinion, is the best. Lemon Pepper was great too but not quite as good. Bring cash! 808 Grindz Cafe - I ended up here twice during my stay in Maui because after the first time, I couldn't stop thinking about their food. The Macadamia Nut Pancake with their house sauce (that's key!) is potentially the best pancake I've ever had. Also, if they have the Kalua Pork Hash Loco, get that as the savory plate and thank me later. The storefront has no sign so make sure you ask or study the Yelp photos well! Da Kitchen - If you want your money's worth, come here. Their Hawaiian 'local-inspired' dishes are da bomb (sorry, I had to). The portions are HUGE so either bring an appetite or grab an appetizer, a main dish and share between 2 people. 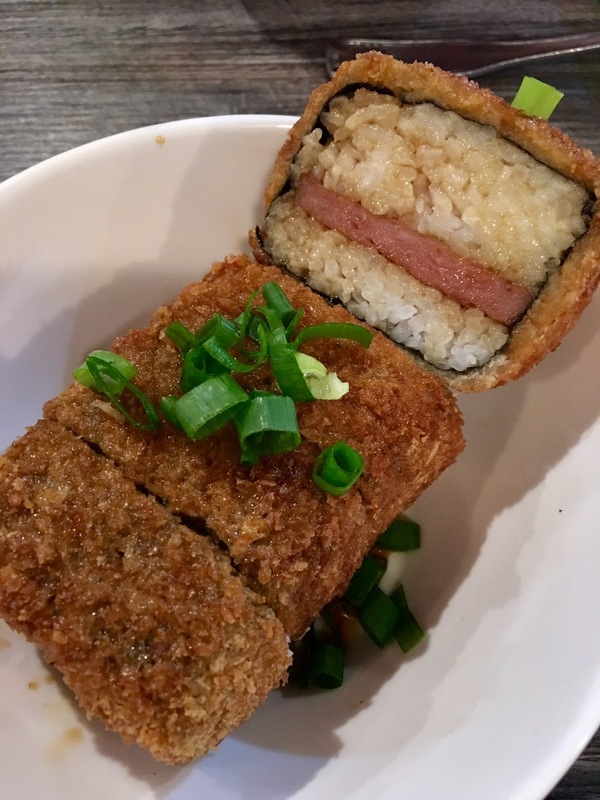 Their Deep Fried SPAM Musubi is their token menu item - try it! Foodland - Yes, Foodland is a grocery store. But wait, not just any grocery store! 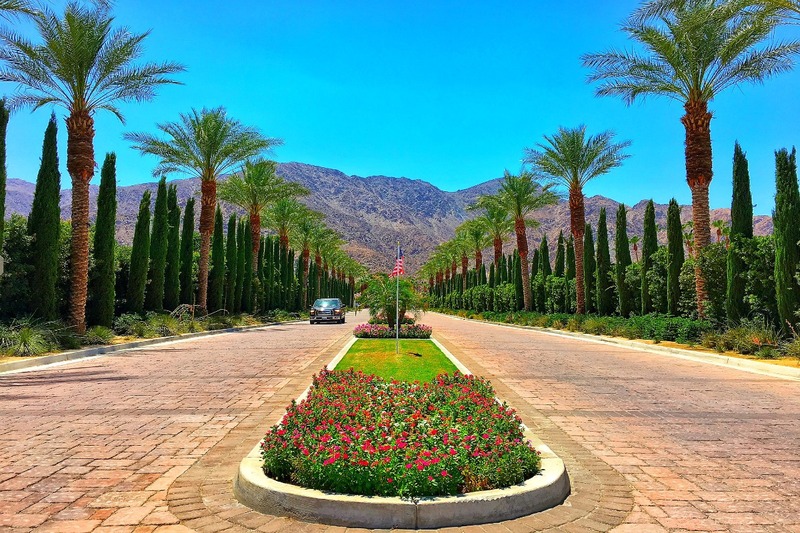 Thanks to Travel Bloggers and social media, Foodland has exploded in the past few years. They're known for their vast selection of poke. Since poke is one of my favorite food items ever, I had to go. 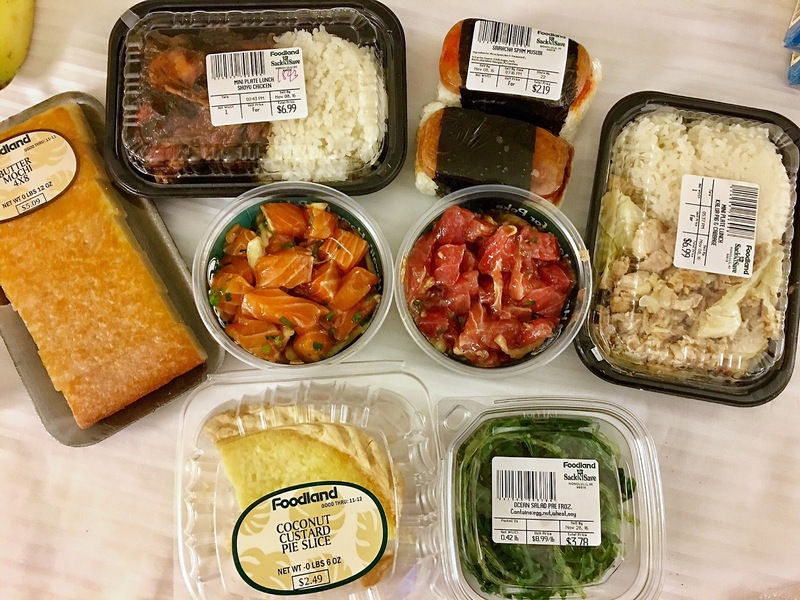 I indulged in several flavors of poke thanks to Foodland including some Hawaiian pastries and coconut pie! Yum! 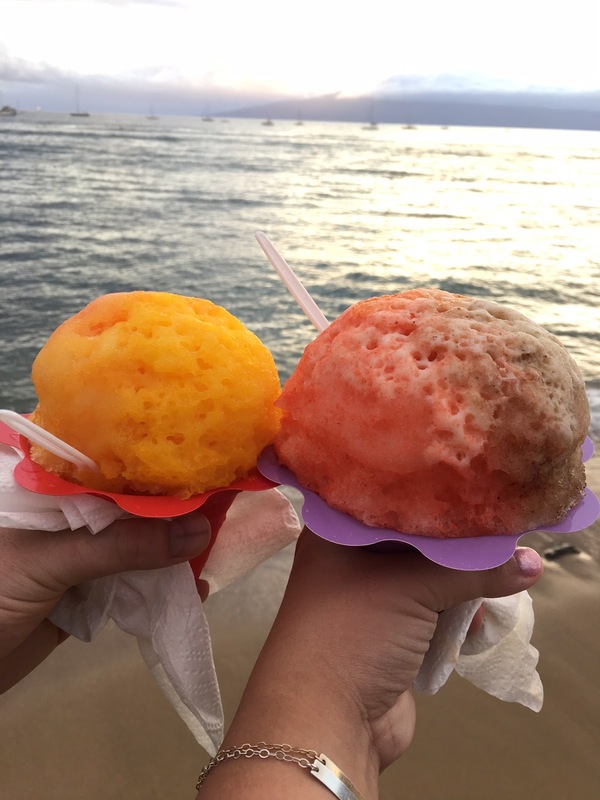 Ululani's Hawaiian Shaved Ice - The famous Ululuani's Hawaiian Shaved Ice. I admit, I'm biased when it comes to shaved ice. To me, Japanese shaved ice is the softest and most delicious. I stand corrected. Ululani's gives a run for its money for soft, delicious shaved ice. My favorite order? Macadamia Nut Ice Cream on the bottom with POG (Passion Fruit, Orange & Guava) topping! 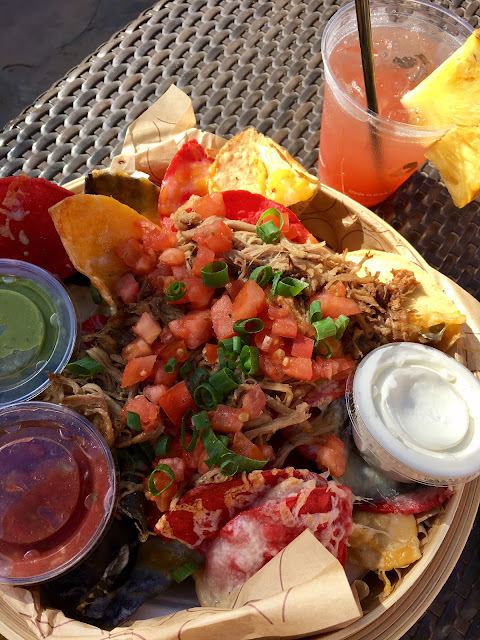 Westin Maui Kalua Pork Nachos - If you like Kalua Pork and Nachos, visit the Westin in Lahaina for their poolside Kalura Pork Nachos. I generally don't eat food at hotels but when I tried this poolside one day, I was hooked. They're very generous with their pork and you don't even need salsa or guac - so, so good! WowWow Lemonade - This is one of those times where I have to thank Instagram. Their memorable mason jars and on-point Instagram account had me in love with their brand. WowWow Lemonade was my first stop :) Their blended lemonade was delicious and I loved having a mason jar souvenir to bring home! 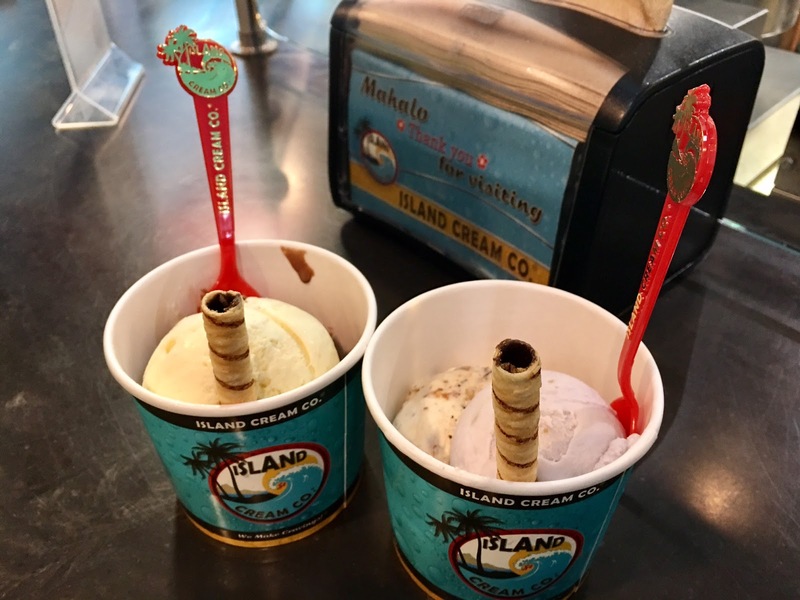 Island Cream Co. - While Ululani's Shaved Ice trumps all cold dessert items in the area, I have to give a shout out to Island Cream Co for their Poi flavored ice cream. Poi is a traditional Hawaiian paste made out of taro roots. It's most certainly an acquired taste but I enjoy Poi and more so the ice cream flavor! Coconut's Fish Cafe - In Maui, Coconut's Fish Cafe is located next door to WowWow Lemonade. That and hunger were the only reasons why I ended up here but boy am I glad I did! Turns out they're extremely popular for their Coconut Shrimp basket and Macadamia Nut Crusted Ahi Plate. Both were crispy, perfectly cooked and to die for! 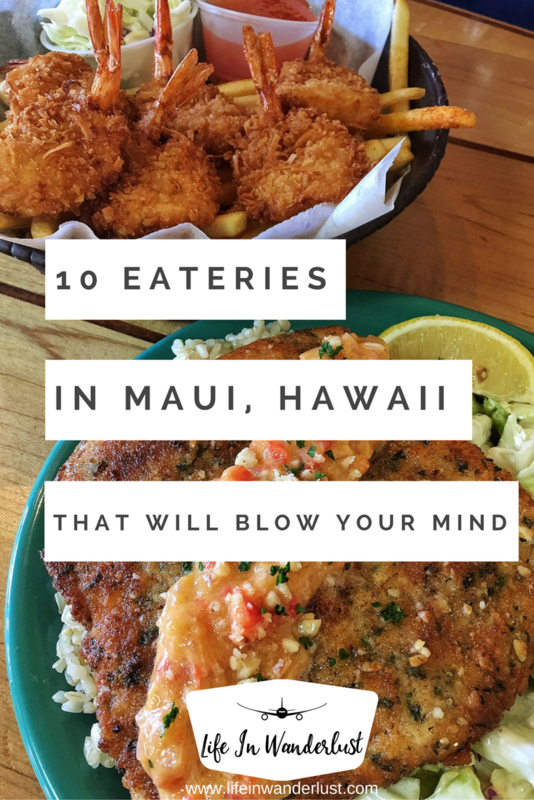 If you're hungry, I apologize :) But if you're on your way to Maui, I hope this list comes in handy! I also want to send out huge props to my friend and fellow food-lover Rosalyn for sending me a lot of these recommendations! If you appreciate food, you'll appreciate all 10 out of 10 spots in Maui! Did I miss any restaurants in Maui? Where's your favorite? OMG why did I have to read this before 10AM? I'm so hungry now. 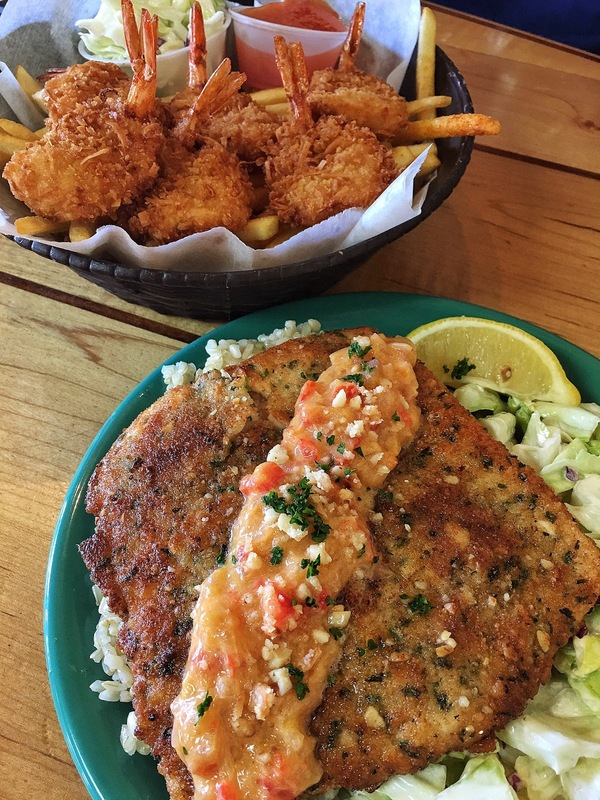 Your pictures made the food look amazing. 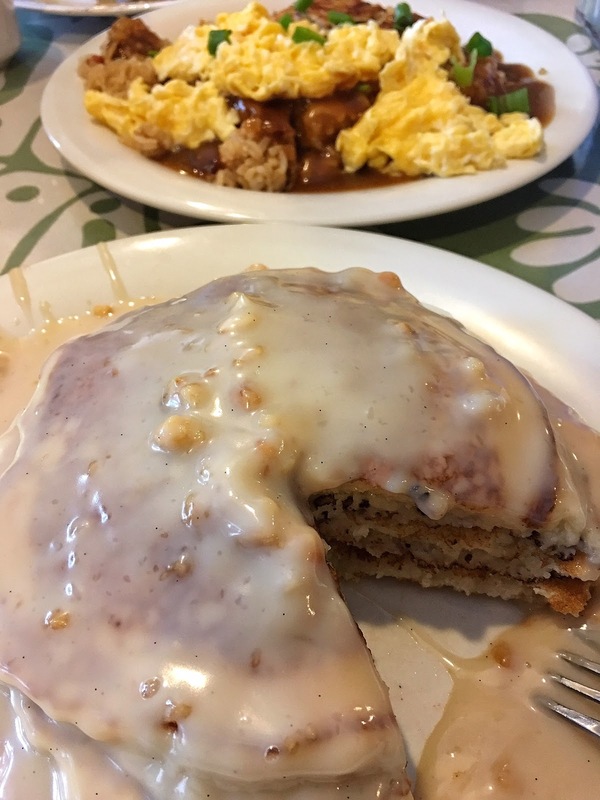 I, too, loved the food in Maui - even at the small breakfast place in Lahaina. I am totally not judging you for including McDonald's! I have a soft spot for Macca's - everything in moderation, right? All this food looks incredible and I think I would love Coconut's Fish Cafe! 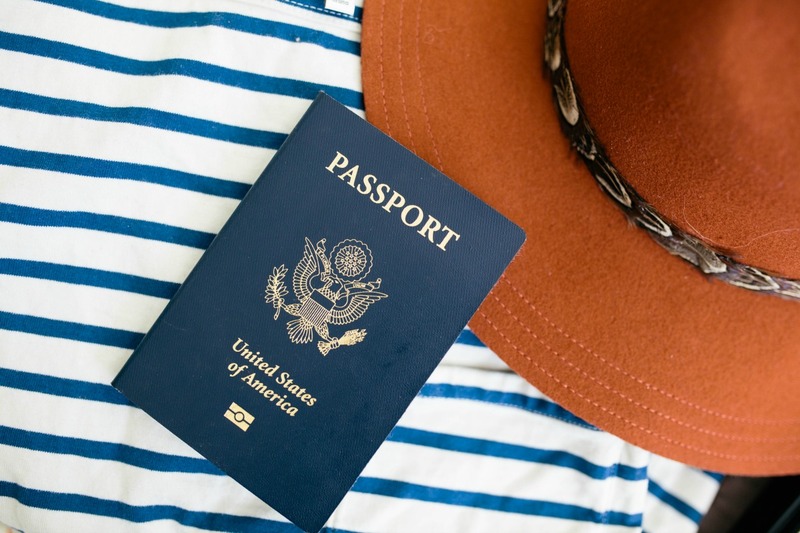 We've never been to Hawaii but it's on our list and now even more so! The shrimp truck and those pancakes sound and look delicious! I didn't realise Spam was such a big thing in Hawaii, how strange. Happy #FlyAwayFriday and Happy New Year! Hawaii is a place I've been dreaming to visit. Now you have added another reason.. Those nachos look divine! I love seeing what different McDonald's around the world serve. It can actually say a lot about the local culture. And omg tha Wow Wow lemonade looks yummy! I'd go get one just for the glass. Dear me Kana if I lived in Hawaii I would be eating all that stuff EVERY day - that McDonalds breakfast even looks delicious! I genuinely wouldn't know where to start!!! That lemonade looks amazing too! Holy crap these all look so good!!! I want everything!!! This is a terrible list....what about Colleen's in Haiku and Cassanova's in Makawao?? So happy I stumbled across this post! I'm headed to Maui on Friday! Everything looks so good but I'm definitely putting Wow Wow and Coconut's Fish Cafe on the list! 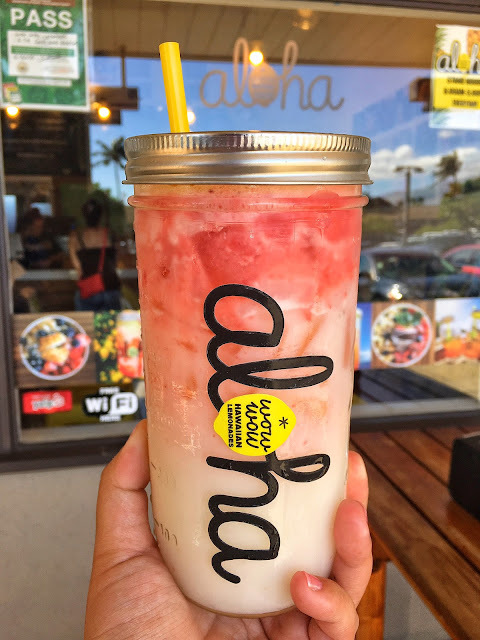 I have been to coconut fish cafe, ululani's shaved ice, and wow wow lemonade! They are all so great! If you go back you must try the gazebo for breakfast and Aloha mixed plate. Aloha mixed plate is one of the only places you can get MOCHIKO CHICKEN, which is delicious! I love how you put FoodLand on the list. I used to live on Kauai and remember spending a lot of my time getting warm, fresh food! Hi Kana! 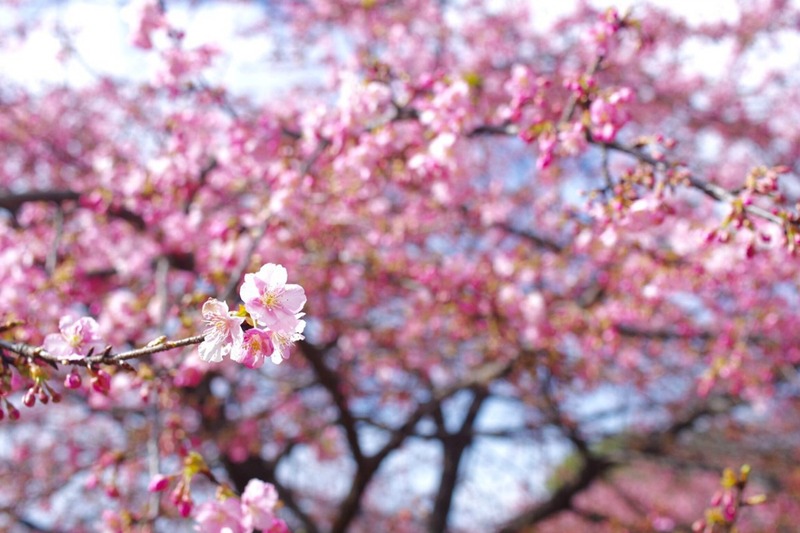 I loved your list, it's going to be so helpful on our upcoming trip (first time back to Maui in 5 years - YAY!!). I'm super excited to try Wowwow Lemonade, yum! We usually stay in Napili so we love the Plantation House for uptown brunch (such good Bloody Marys and Benedicts) as well as The Gazebo for hearty breakfast... but THOSE PANCAKES! We're going to make a special trip to go find those, should be fun! Aloha! I know this is a silly comment, Kana, but having lived in Hawaii on Oahu for a long time and Maui being a fave place to Island hop, I can't help adding this to your great pics! No, it's not necessarily from any particular restaurant,(in fact I can't at the moment think of eating any in restaurant), but who should leave any part of Hawaii without trying their unique "Potato-Mac Salad"?!!!!! Did you? If not, look up the Foodland recipe, because I can't find Safeway's!!! Mahalo and Aloha! Next time you go, you MUST stop at Leoda's Pie Shop in Olowalu. They have awesome savory pies (chicken pot pie is my fav) but the chocolate mac nut, olowalu lime, banana, and coconut pies are what I dream of in between our yearly trips. We stop on the way from the airport to Ka'anapli, several times during the 2 weeks we are there, and on the way back to the airport. It's a good thing we snorkel and hike a lot to burn off all those calories!!!! Everyone's food tastes differ but we tried the WowWow lemonade and it was disgusting! We threw it away. They were out of about 10 ingredients and they offered us an upsize of their limeade (it's literally all they had available) and we drank about 5 sips of it and chucked it. Yuck! Not impressed at all. The good: We loved loved Kihei Caffe and went two mornings in a row. Awesome food, awesome service. I second Leoda's for pie. Delicious! My hubby's favorite is the McDonald's breakfast. He loves rice and spam. We tried Da Kitchen and it was just okay. Nothing great. Thanks for all of the recommendations! I wish we could have gotten to try more places. Good to know about Kihei Cafe and Leoda's Pies! I'll have to go check it out next time! Thank you for the recommendations!